As part of the agingcare.com network I want to share this article about POAs written by Lori Johnston. Squabbles over assigning Power of Attorney – who can act on your parent’s behalf – and the decisions made in that role can impact the family dynamic for years to come. Even when mom or dad plans ahead and creates the Power of Attorney (POA) legal document before they’re impaired by a health condition, there can be ongoing strife among siblings and family members. Sometimes the decision of who to appoint in the Power of Attorney role, from the parent’s standpoint, is cut and dry. Parents will put their faith in the oldest child, or choose one child over another based on who lives closest or whom they trust because of their skills, especially with financial decisions. In other cases, a parent is suspicious about their child and doesn’t trust them 100 percent with their money. Sometimes if the oldest isn’t chosen, there’s emotional backlash toward parents and siblings because they are insulted by the decision. Depending on the state, multiple people can be appointed Power of Attorney, but that can result in arguments later, if they cannot agree on a decision. Or if living in a state where there are different types of Power of Attorney, such as for healthcare and financial decisions, the duties can be separated between siblings. “When it comes to healthcare decision-making, if the child is a nurse or doctor, that child oftentimes is named first because they’re more attuned to health care issues. If the child is a financial planner, they may be named first for financial decision making,” says Ronald Fatoullah, a certified elder law attorney and founder and managing attorney of Ronald Fatoullah & Associates. If the appointment of POA is smooth and didn’t involve much gnashing of teeth, that doesn’t mean bickering won’t begin once the person granted POA assumes duties related to parents’ financial and medical decisions. Many times, the challenge to the POA happens after the parent passes away, Anderson says. While the parent is still alive, a sibling may try to trump the person appointed POA by saying their parent was incapacitated when making the decision. When that happens, it can result in an expensive guardianship fight in court. Ongoing sibling rivalry can chip away at the “power” that someone granted Power of Attorney holds and cause kids to argue over daily and long-term decisions. When the siblings don’t trust the person granted POA, what Anderson often sees happen is constant questioning about decisions. One or multiple siblings may appear to be always on the POA holder’s back, challenging each health care and financial decision, she says. The POA holder must act in the best interest of the person they are representing, even when it comes to making those tough health decisions. “If he or she doesn’t, that individual can be sued,” Fatoullah says. In one case, Anderson says the sibling who was granted Power of Attorney for health care refused to comply with the mother’s living will. “Another sibling said, ‘Mom said to pull the plug,'” Anderson says. At a bedside hearing, it was determined that the POA appointee was not acting in the mother’s interests and the living will request to withdraw life support was fulfilled. Once siblings start to question what is happening to their inheritance, the battle over finances heads to court, and it can happen whether the parent is alive or has died. In a frequent scenario, the person appointed POA may decide to pay themselves back for the expenses of caring for a parent, such as driving them to doctor’s appointments and buying food or medications. “When one child spends more time taking care of a parent and feels like they should be entitled to more, they can give themselves more,” Fatoullah says. But the other sibling doesn’t think it’s fair, saying that the POA holder is taking more than their 50-50 share of their inheritance, after their parents’ death. Even if the decision over granting Power of Attorney isn’t emotional, things can take a turn among families when the POA starts making decisions. Attorneys say resolving sibling rivalry and creating trust among family members can help avoid family feuds over Power of Attorney and costly court battles. If you have a question about how to create a POA or address a POA issue, feel free to call me. Robert Negele is a 90-year-old retired executive who has lived in Connecticut for almost 40 years. Despite decades of community involvement, including service on corporate and charity boards, he and two of his children who live nearby are seriously considering leaving the state. “It’s a prime possibility we discuss at Sunday night dinners,” Mr. Negele says. A big factor in their deliberations: Connecticut’s estate and gift taxes, which tax assets above $2 million per individual at rates as high as 12%. Mr. Negele says some snowbirds at his Stamford retirement home have shifted their tax home to Florida, while others he knows have left the state altogether. Mr. Negele is far from alone, estate planners say. “State death taxes are considerably more important than they used to be, and we spend a lot of time planning for them,” says Beth Kaufman, an estate-tax lawyer at Caplin & Drysdale in Washington, in part because of changes in the federal tax laws. Nineteen states and the District of Columbia, home to just over one-third of the U.S. population, levy an estate tax on the assets of people who die or an inheritance tax on heirs receiving assets. 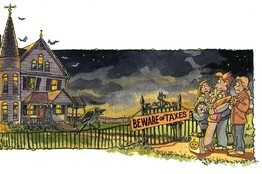 Maryland and New Jersey have both, although each allows offsets to prevent double taxation. Many states also have far smaller exemptions than Uncle Sam’s. The threshold is $1 million for estate taxes in Massachusetts, New York, Oregon and Minnesota, and just $675,000 in New Jersey. Pennsylvania’s and Iowa’s inheritance taxes have no exemption in some cases. 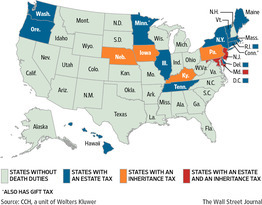 However, all states allow surviving spouses to inherit tax-free from their partners, says James Walschlager, an estate-tax specialist at CCH, a unit of Wolters Kluwer. Only Delaware and Hawaii track the U.S.’s $5 million-plus exemption, according to Mr. Walschlager (see table on page B10). Rates can be high as well. The top rate often is double digits, with Washington state’s the highest: 20%. Quiz: Seniors, Are You Ready for Your Future? Thanks to AARP you can find out if you are prepared. Whether it’s your financial future, your legal future or your health this simple quiz is very helpful. Spend a few minutes and check it out. If you find that you need any of our legal services, we gladly offer AARP discounts to members. TAKE THE QUIZ: CLICK HERE. What are the advantages of a PrePlan — pre-paying funeral expenses? There are many advantages. Both financial and practical. On the financial side, New York State allows an individual applying for Medicaid or Supplemental Security Income (SSI) to set aside funds in an irrevocable account for their funeral and burial expenses. These funds are considered an excludable asset, meaning they are not counted as a resource when determining eligibility. A Medicaid/SSI applicant also has the option of setting funds aside to pay the funeral/burial expenses of certain family members. Any account established for the benefit of a family member must, under New York State law, also be irrevocable, as any and all funds in such account would be an excludable asset as well. On the practical side, a PrePlan makes it easier on your family members or loved ones. With everything planned and prepaid there is less stress and burden on others and better decisions can be made at a much less emotional time. Eliminating financial and logistic decisions also allows for less anxiety at a time when fond memories, sharing and grieving are important.